It was an honour to be installed as the Worshipful Master for the Lodge of Lights No.148, Warrington, Province of West Lancashire, UGLE, on Monday 22nd of January, 2018. One of my ancestors Henry Harrison was a member of the same lodge back in the early 19th century so the lodge has always been like home in more ways than one. It was also an honour as a historian to have taken my obligation on the ‘Ashmole Bible’ – a Geneva Bible dated to 1599 that, according to lodge tradition, was the Bible that Elias Ashmole took his oath on when he became a Freemason in Warrington in 1646. It’s the first time the Bible has been used in living memory (the oldest surviving member of the lodge who entered back in the early 1960s can’t ever remember it being used as it had been replaced by a late 19th century Bible by then). 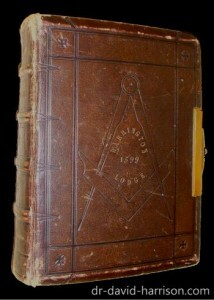 The Bible is now on display in the Warrington Masonic Museum, and an article discussing its history can be seen here. I was also honoured to have three distinguished guests; Masonic historian and member of Quatuor Coronati Lodge John Belton, and Liverpool Masons Dave Wood and Ian Jackson (seen in the photo above). A write up of the event can be seen on the Warrington Masons website here.